Stripers like this one are tearing up the topwater lures on the Wateree River. Anglers wanting to experience one of the hottest topwater bites they’ll ever see will find it right now on the Wateree River. 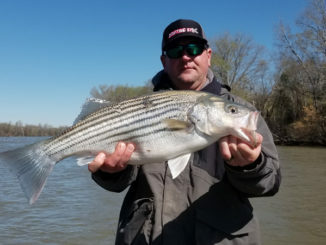 The stripers are aggressive, hungry, and not too picky about what they’ll bite. These fish are congregated mainly in one section of the river between the Hwy. 1 bridge in Lugoff and the Wateree Dam. And that’s what makes this one of the lesser-known bites taking place across the state. This area is difficult to access. “If you don’t have a jet drive on your outboard, you’re not going to make it in and out of this place. Propeller drives just don’t do good around all these rocks and shoals. 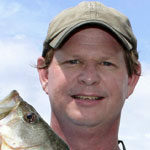 So without a jet drive, you simply can’t reach these fish,” said Jason Wolfe of Wolfe’s Guide Service (803-487-3690). Wolfe uses a G3 aluminum johnboat equipped with a Yamaha 90/65 jet drive. With this setup, he can access the area no matter what the water level is like here. And the water level changes depending on how many floodgates are open on the Wateree Dam. This often changes throughout the day. The shoals below the Wateree Dam are the hottest spot for catching these fish right now. The stripers love getting into those shoals because they breaks up the current and gives them places to ambush prey. 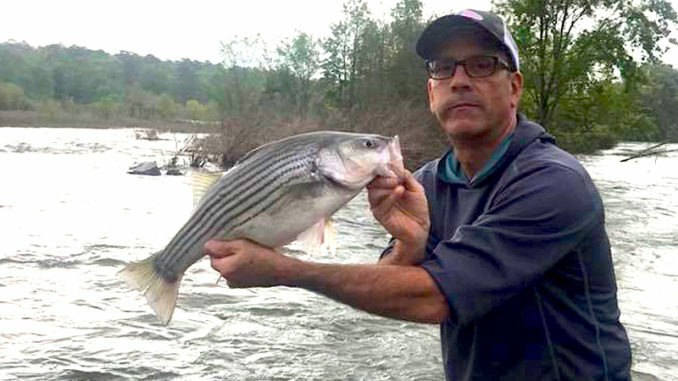 “Anything that creates some slack water, the stripers like to get in there. And the eddies and swirls created by the current against the rocks will tumble the bait around. This gives stripers a lot of easy meals,” said Wolfe. A variety of topwater lures work in this area. Wolfe said it’s best for anglers to cast them slightly up current, at about a 45-degree angle, then work the lures back in. Some anglers are tempted to cast straight upriver, but this usually creates a great deal of slack in the line. Because as soon as the lure hits the water, the current is pushing it back toward you. That makes it difficult to detect bites, and impossible to set the hook. These fish are strong, and don’t come to the boat without pulling drag and making several runs. So Wolfe suggests a strong medium-heavy to heavy powered rod, a high-speed reel, and 30- to 40-pound line. 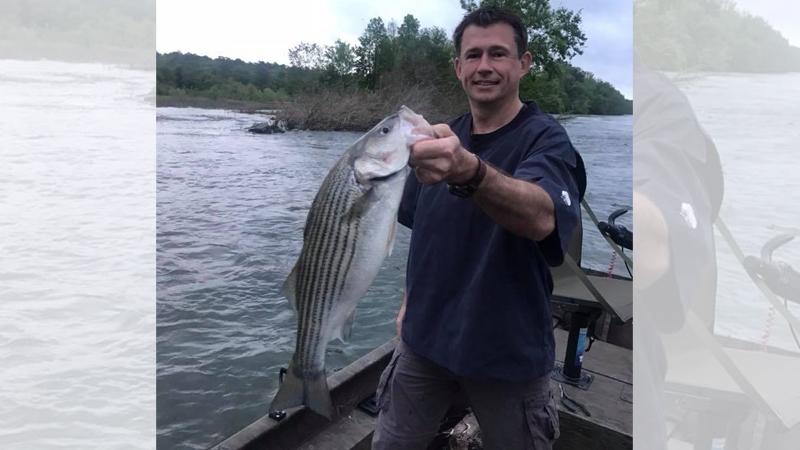 The Wateree River stripers are aggressive, hungry, and not picky about what they’ll bite. Wolfe likes to get on the river very early, but that’s mainly to make the most of the day. He said the stripers will bite throughout the day. And because he wants plenty of light before he runs up into the shoals, he will anchor down just below them and make a number of casts to bank indentions, behind fallen trees, or any other obstruction that cuts the current down. “Some fish will hang out in those areas as they move upriver. And after I’m anchored for a while to fish a spot, I can sometimes catch them behind the boat. They’ll move into the slack water created by the boat. Don’t overlook any kind of disturbance to the current. 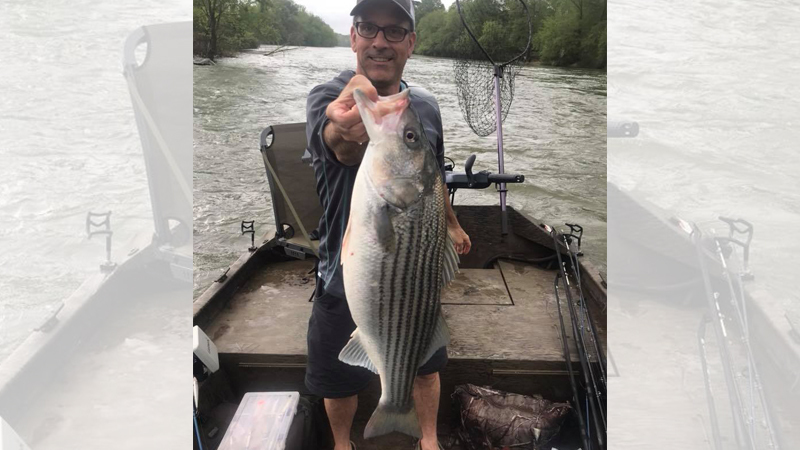 There’s a good chance stripers are using it to take a break,” he said. Wolfe looks for the hot topwater bite to continue like this for some time. “It usually gets even hotter in May. It’s good to see it’s already started. It’s about as good as you could hope for right now. They are biting like mad,” he said.